Employee development and leadership training providers meet your businesses’ training needs by offering a range of topics, from computer skills to health and safety with multiple delivery options such as classroom and e-learning. Training providers give employees the development skills they need to improve their job performance. To help support small businesses, we looked at six national employee development and leadership training providers that offer a variety of training topics — such as safety and compliance training, office skills training, sales training, leadership development, and technology skills — to identify the best for small businesses. We excluded niche providers, such as training providers that only offer educational programs in a specific industry or profession like real estate. We also excluded training companies focused on developing highly customized training, such as instructions on how to work your small manufacturing company’s specific equipment. We recommend GP Strategies because they provide a broad range of training topics, including leadership development, safety, customer service and sales. It has off-the-shelf training courses for specific occupations like maintenance workers and equipment operators. 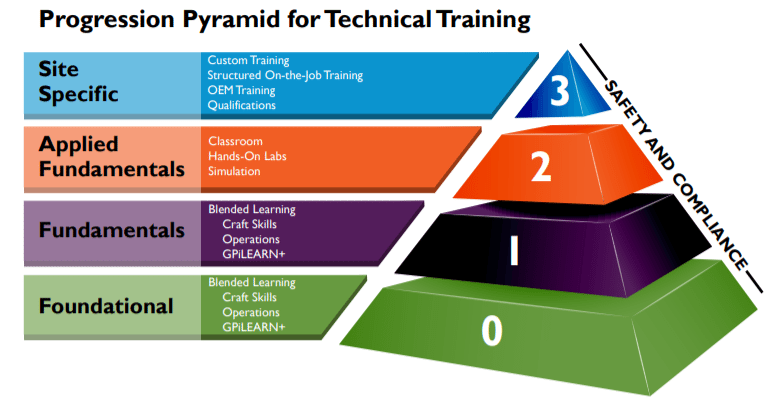 It will conduct a training needs assessment and then offer existing courses like the ones shown below or custom training provided online or on-site. Working with GP Strategies as your training provider is like having your own training department. Its off-the-shelf courses use a blended learning approach following sound instructional design methodology. Additionally, it can customize its courseware (for an upcharge) to meet your business needs. GP Strategies costs between $250 and $500 per year per employee for a seat license. The rate decreases as you add more learners and some specialized categories, such as electrical or power/energy, cost more as does customization. Its setup fee starts at $2,500 and provides you with an LMS to assign and track employee training. If you renew the site licenses, you’re no longer charged a setup fee after the second year. The way GP Strategies works is by using a four-step approach to training, which it refers to as a Progression Pyramid: Foundational, Fundamentals, Applied Fundamentals and Site Specific. What this means is that it ensures your employees have the entry-level skills and knowledge first, and then it builds your employees skills with hands-on experiences. Like Udemy and Skillsoft, GP Strategies provides an LMS system so you don’t have to purchase one separately to track employee training enrollment, successful course completion or reports. There are other training providers like GP strategies that provide both off-the-shelf content and can help customize courses for your business like Alliance Training and Consulting and Unicorn. In addition, many HR vendors provide standard business courses and training as part of their overall HR outsourcing service offerings. GP Strategies provides administrative support to you and your employees by phone during regular business hours, Monday through Friday from 8 a.m. to 5 p.m. Eastern time. Unlike Udemy, AMA or New Horizons, you can’t just sign up for a single course. You have to sign up for an entire package and purchase seat licenses like you do with Skillsoft. If you’re only looking for one or two training courses, such as customer service skills or how to use Microsoft Office, then GP Strategies will likely cost too much. It’s best for those who want to invest in a learning culture, not individual courses. We recommend New Horizons as the best training provider for information technology and computer skills training. It offers courses in Microsoft, Adobe, SQL and applications like SAP and Salesforce. They also offer project management and Six Sigma training and certification to support technical service-type companies and IT projects. In addition, they have basic offerings in leadership and human resource management and provide training in several modalities. New Horizons prices start at free and go up to $1,500 per class. 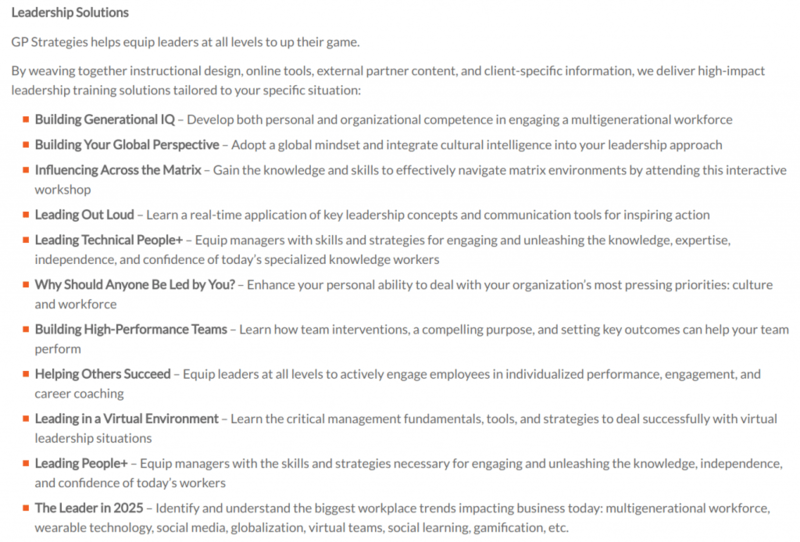 Free webinar topics range from leadership development to technology. Classroom-based workshop prices vary from $275 per day for a Microsoft Excel course to $395 for project management fundamentals, up to $1,500 for a seminar on leadership. They also provide free IT content on topics like cybersecurity, ERPs and innovation. New Horizons also offers volume pricing discounts. Club memberships, like the live online training unlimited club membership, costs $1,495 a year; or the basic office skills training courses for only $360 a year. Both provide videos, online manuals, self-paced courseware, hands-on simulated labs and printable job aids, ensuring your office worker can master MS Office. 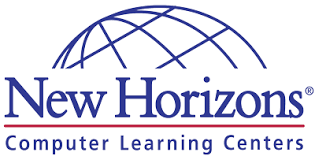 New Horizons delivers courses in multiple ways, such as instructor-led training, classes at your site or at one of its training centers worldwide. It also has online training, recorded e-learning and instructor-led webinars. Alternatively, you could choose mentored learning or even a private class for your team. It can also help you set up a custom training portal with branding, similar to what other training providers offer on an LMS. In addition, New Horizons provides room rentals with computers so that if you need to offer training on your custom or off-the-shelf software, you can use its facility to do so. That’s something you get with New Horizons that other training providers don’t offer. If you’re looking specifically for IT courses, training providers like Global Knowledge and Learning Tree also offer a large range of subjects. Global Knowledge is a bit more specialized with topics like application development and cybersecurity, and Learning Tree tends to be pricey as compared to New Horizons. New Horizons offers a live help desk to call, or you can contact your local training center Monday through Friday from 5:30 a.m. to 6 p.m. local time. New Horizons also has online chat where you’ll interact with a live human, not a chatbot. With a focus on technology training delivery, rather than custom development and instructional design, it may be difficult to tailor the training to the specific way you use your software without significant upcharges. In that sense, it’s more like sending your employees to a college-like training center than having customized classes. We recommend the American Management Association (AMA) for all kinds of business training, from managing an office to customer service. It provides courses in 25 subject areas and hosts its workshops live or online providing flexibility similar to that offered by New Horizons and Udemy. Its content is provided via seminars, web events and even books, white papers and podcasts. AMA seminars cost from $1,295 for a one-day presentation skills workshop to $2,345 for a two-day workshop on leading virtual teams. However, most podcasts are free on topics from how to be a first-time supervisor to improving writing skills. Webinars are less expensive; for example, courses on Mastering Excel Pivot Tables or Improving Productivity Using Microsoft office cost only $199 each. In addition, many of the webinars are free. Discounts are available if you become a small business AMA member for $2,295 a year or purchase an e-membership plan for $50. AMA offers the most variety of training and content delivery, from newsletters to podcasts, online courses and classroom-based workshops. You may choose to try AMA out by viewing free podcasts and webinars before attending live sessions because there’s so much variety in what it offers and how it offers them. AMA offers seminars in 25 different areas. Each seminar runs from one to five days. These are in addition to the lower-priced (or free) podcasts and webinars and cover most of what business owners would want for themselves and their team members. 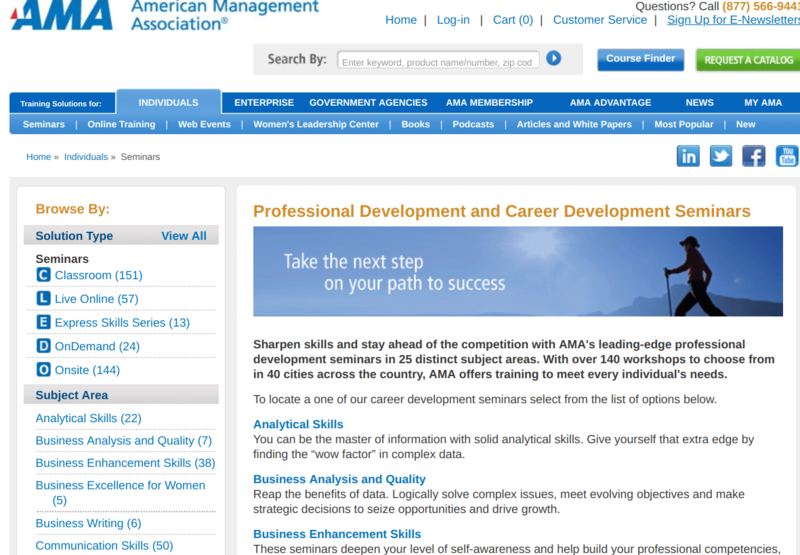 Another training vendor with a large range of courses like AMA is SkillPath, where your employees can find seminars by topic or ZIP code, in addition to online courses. You may also find similar courses offered at a community college in your area. AMA provides customer service by phone, fax, email or via an online web help request form, making its support one of the best. However, it doesn’t offer live chat. AMA doesn’t provide a free LMS to track your employee’s progress, so you may need to purchase an LMS or use HR software that has an LMS if you want to assign courses to employees and verify course completion in one place. It also doesn’t provide safety and compliance training like Skillsoft and GP Strategies. 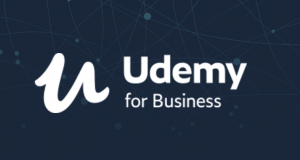 We recommend Udemy as the best training provider for employee-directed learning, which is when you let the employee choose what courses they need for skills development from the provider’s 65,000 online courses. Udemy also offers a business package that provides 2,400 of the most common business training topics, including sales training and customer service, as shown below. Udemy offers a 14-day free trial so you can try out any of its classes like the sales, HR or project management courses for free. Udemy courses start as low as $10 per class for one-off courses your employees might take. Prices range from $9.99 to $199 per course with volume discounts. However, a business package will run between $240 and $300 per year per employee with discounts as you add more staff. The big difference between the Business package and the Enterprise package is the LMS features, customization and reporting you receive. However, until you are sure that your employees will attend the courses you want them to take, you may be better off having the employee sign up and take courses on their own, even if they submit the receipt to you for reimbursement. For example, if they take only one course a month, such as Business Law for $13.99, the student price may be cheaper than an annual business subscription. With Udemy, as with Skillsoft and GP Strategies, you can get the LMS functionality if you upgrade to the Enterprise package. However, even without upgrading, your business staff has access to an entire library of online business topics provided via learning with live instructors. If you want dedicated reports, dedicated customer support and single sign-on, the Enterprise package is the one to choose at only $60 annually per person extra. 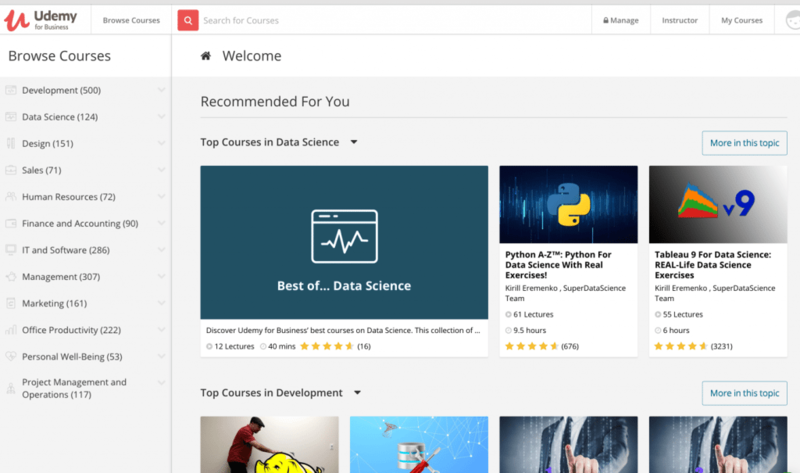 You can’t find more course topics than on Udemy (65,000 courses), but they’re all online, not on-site courses like you might get with New Horizons or GP Strategies. Many are taught live by experts in their respective discipline, from law to HR. Udemy’s course catalog is also one of the easiest and most intuitive to navigate. Its courses range from finance to office productivity and even include personal development webinars. Several low or no cost open-source and online training sites have launched in recent years with a broad range of topics — from vendors like Coursera, Lynda.com and Khan Academy. For example courses at the Khan Academy are free, while Lynda.com costs only about $25 per month with courses hosted on your free Moodle Learning Management System. Udemy provides customer support through an online help request form and online chat. They also have a library of self-service user support topics. Its hours are Monday through Friday, 8 a.m. to 6 p.m. Central time. If you send a technical support question after hours, its off-site support staff will usually get back to you within a few hours. Additionally, learners who have a question on the training topic can email the instructor directly. While Udemy offers safety courses, they’re for learning purposes only, not guaranteed to be OSHA-compliant. Being an online training platform, it also doesn’t provide customized courses delivered at your work location. We recommend Skillsoft as the best training provider for compliance training as well as an LMS to track it. 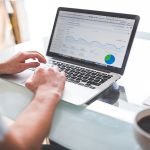 In addition to compliance, it offers business and IT training like Udemy and GP Strategies, but what it provides in terms of an LMS allows you to track certifications that are due. When employees attend safety or legal compliance training, Skillsoft will provide online documentation of what, when and who completed each course. Like New Horizons, Skillsoft also provides a great number of IT certifications, such as Red Hat, Oracle, Cisco, Google and Amazon. Skillsoft offers multiple pricing tiers, and it’s best to contact the provider directly to determine the course content you want first. Below is an example showing prices from $500 for the Select package to $651 a month for Select Plus package (for a company with 25 employees). That ends up costing about $20 per month per employee, which is in the same range as Udemy or GP Strategies. Price $500/month $651/month Call for pricing. Requires a setup session. Skillsoft was designed as a training content provider and provides both the courses and the LMS system to host and track them on. It offers several catalogs and users can choose a set of courses from one or more catalogs, such as compliance courses, or leadership topics. Skillsoft also makes courseware available through a mobile app, such as on an employee’s iPad as shown below. Skillsoft is very much is a class all its own. It has a best in class LMS (Skillport) as well high-quality course content. We recommend Kineo and SkillPath as other vendors with courseware similar to Skillsoft. Kineo provides courseware through its LMS much like Skillsoft, but SkillPath doesn’t have that LMS feature. 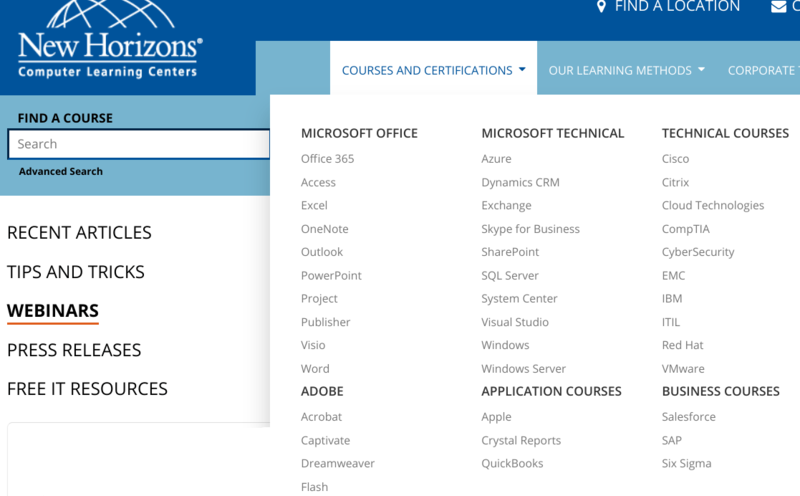 Most training vendors offer courses or an LMS, not both like Skillsoft. Skillsoft provides support online 24/7, and it also has website chat, so either the training administrator, such as a manager, or the employees themselves can get help. Depending on the courses you purchase, you may also receive a dedicated LMS administrator to support your account during standard business hours. 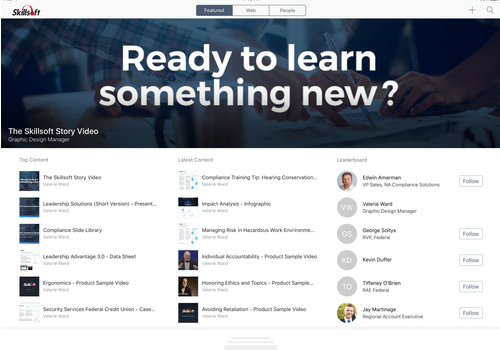 Skillsoft, like GP Strategies, doesn’t sell courses one-off the way Udemy and New Horizons do, so you’ll want to consider your entire organizational training needs before investing in Skillsoft’s training platform. You also need to contact the provider directly for pricing as it’s based on the package of courses you want. We recommend Sandler Training as the best training provider for businesses that want solid sales development. In addition to online courses, books, audio programs and motivational tools, it offers four levels of sales certification. It provides a train-the-trainer method that allows your sales leader to attend training, become certified and then cascade that sales training to your team. Online courses on Sandler are priced individually and run between $47 and $249 per course. However, the real value of Sandler Training is having onsite sales training customized to your industry, using your CRM software and tailored to your sales funnel. To get a quote for customized training, you’ll want to contact the Sandler Training location nearest your business. In addition to sales training, tools and support, Sandler Training offers an annual sales and marketing conference for sales leaders to attend, network with and learn from other sales professionals. 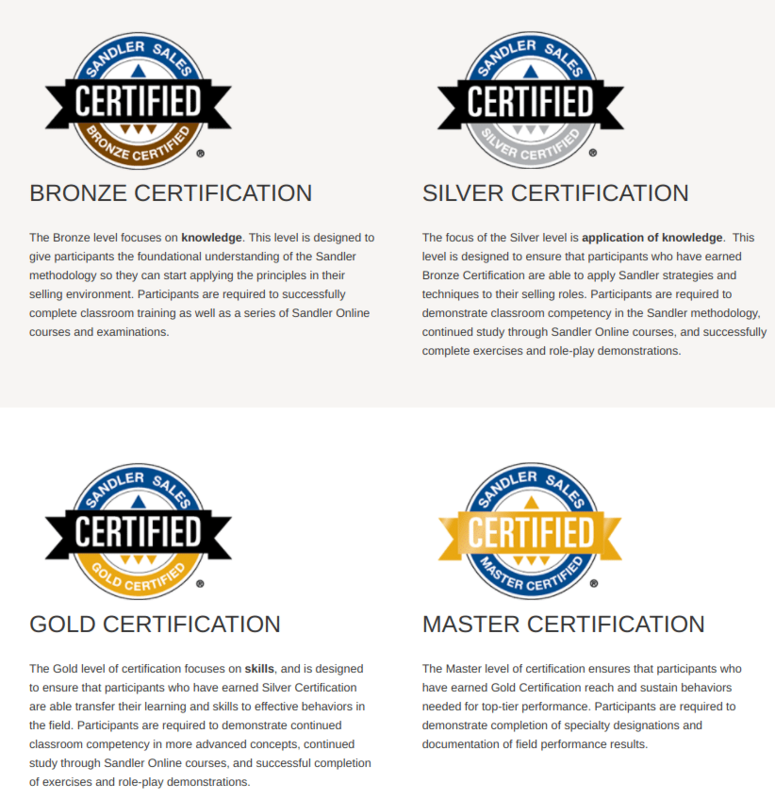 Because Sandler is a franchise sales training organization, the training and tools you receive will be fairly consistent as well as proven worldwide. Sandler Training courseware is based on its proprietary training model, but it customizes it to your business, including looking at your industry, company size, client base and revenue goals. It provides training on all aspects of the sales cycle, marketing, communication, sales metrics, business planning and customer service, for example. It also provides industry-specific sales training to support professional service providers like accountants, medical professionals and attorneys to develop and grow their business. There are a number of good-quality sales training providers, both public and private, as well as those that offer online training options. We showcase 20 examples in our article on sales training programs as well as provide a listing of the top sales training videos. Sandler Training customer support is Monday through Friday based on the office hours of the certified Sandler Training location you work with. The offices are typically open 8 a.m. to 5 p.m. in your time zone. 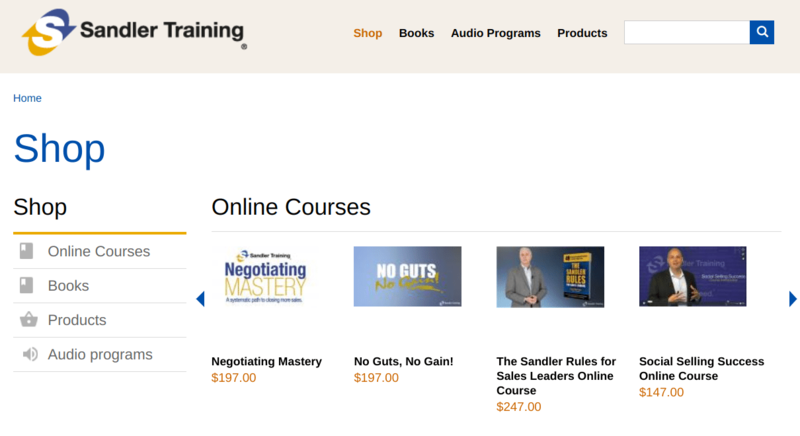 Sandler Training provides certified sales trainers, but it isn’t going to have an LMS like the companies that provide training on multiple topics. Its online catalog of courses is fairly small. This provider is more classroom and on-site based in its approach. In addition, you need to contact the provider to share your sales goals in order for it to provide you with a training proposal that fits your business. While FitSmallBusiness is not a training provider, our free small business articles are educational. 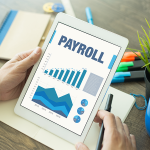 We also provide free webinars and how-to guides on topics like accounting, QuickBooks, payroll, hiring or rolling over your 401k to start a business. However, when those aren’t enough, we hope one of the training providers described above will meet your needs for employee training and development.